Man, another challenge brought to you by the most talented Beate. 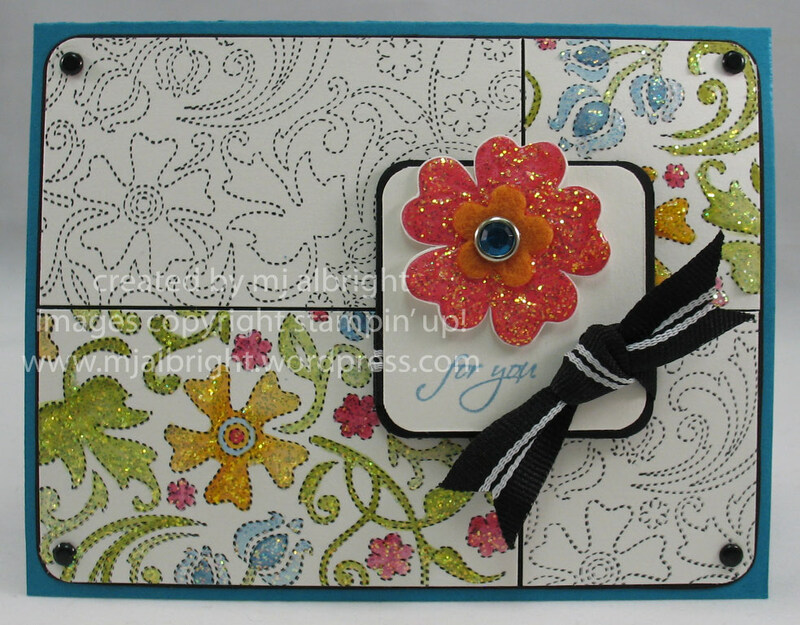 This card I made for her “be inspired challenge” that you can see the details here. I used MFT Meet me at the Cafe to somewhat coordinate with the challenge image, MFT Behind the Scenes to create the brown stripes, and MFT Build a Bouquet for the circle image. 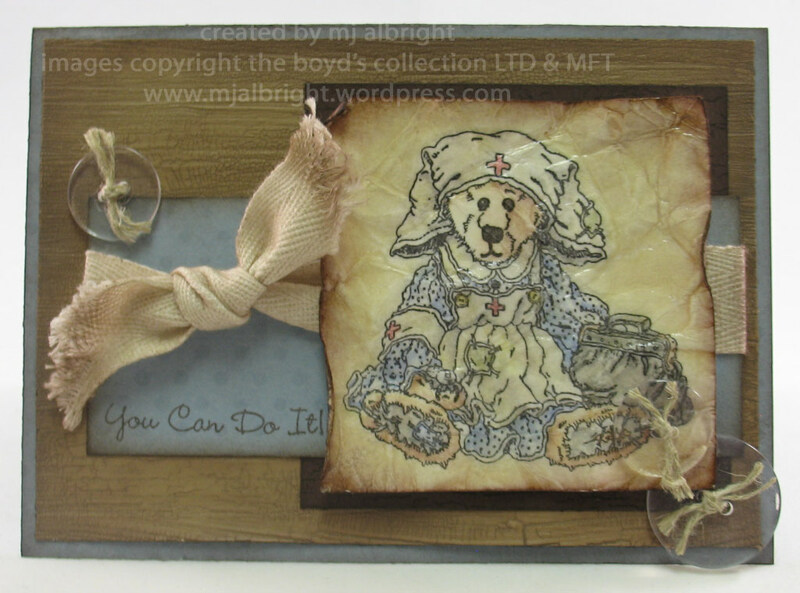 Make sure you head on over to Beate’s blog and check out all the samples created for the sketch…and have a great day! STAMP SETS USED: MFT Meet me at the Cafe, Behind the Scenes, and Build a Bouquet. 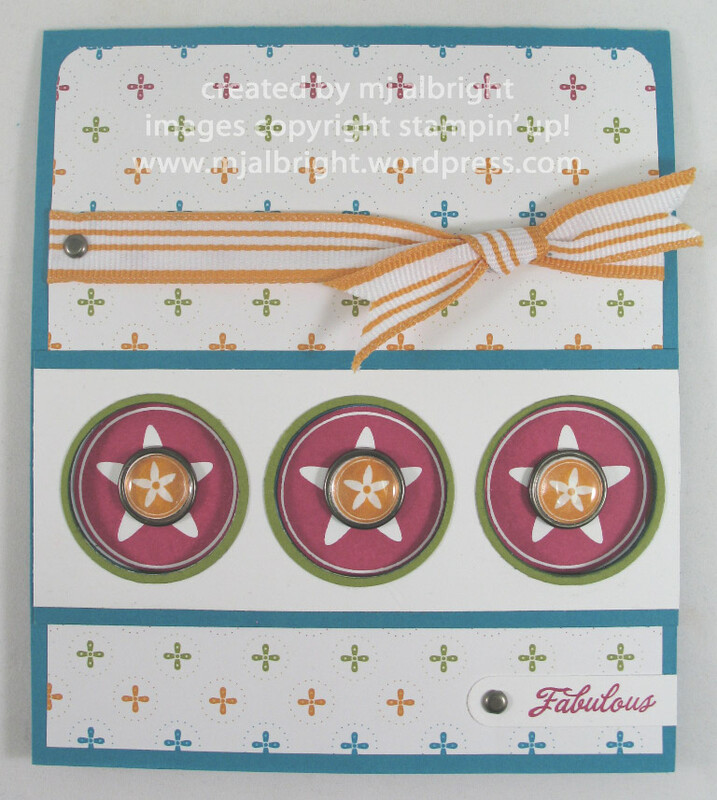 CARDSTOCK USED: Whisper White & Chocolate Chip CS. INKS USED: Stazon Timber Brown, Memento Rich Cocoa Dew Drop, SU! Certainly Celery, Tempting Turquoise, Apricot Appeal, Pumpkin Pie, Wild Wasabi, Almost Amethyst, and Regal Rose. ACCESSORIES USED: May Arts Ribbon, SU! 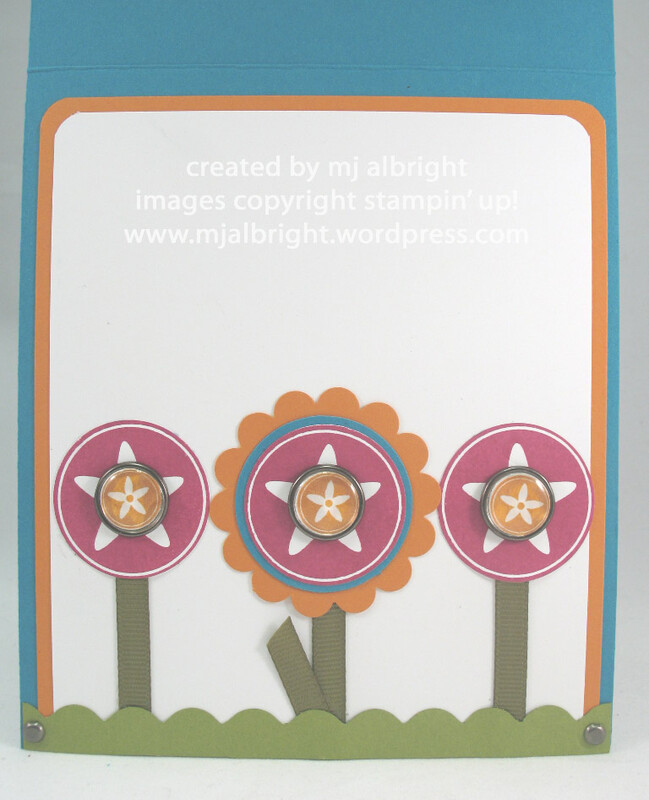 Pretties Kit, 3/16″ Corner Rounder Punch, Stampin’ Sponges. I decided to pamper myself and create a little something to go with it. While browsing around Target, I found rectangular tins at the dollar spot and couldn’t resist picking up a couple to decorate. As the song goes, “these are a few of ‘my favorite things’!” What do you think? Such a cute gift idea for a new mom or bride, or even the mom who just needs to slow down and take a break. How about Mother’s Day? 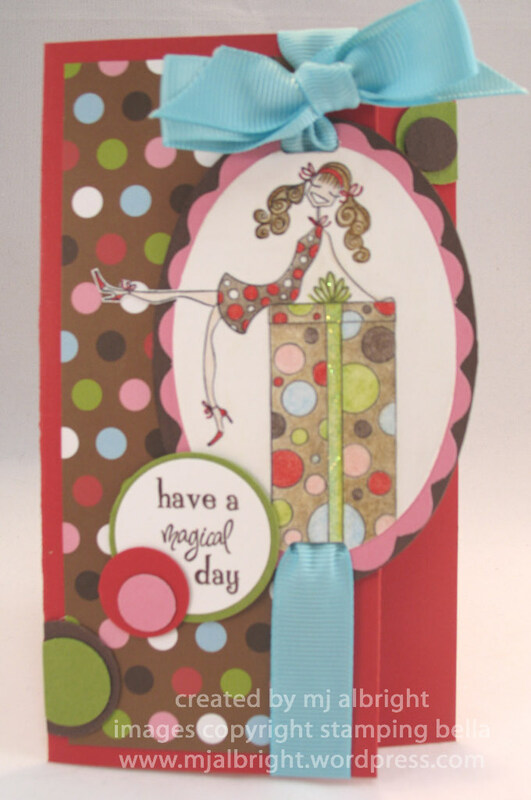 I found a my favorite things rub-on (link is a little different from the one I used) from My Mind’s Eye and had to have it to go with some of my stamps…lol It goes perfect with the MFT Time for the Bubbly stamp set. Which goes perfect with my bathing supplies tin. 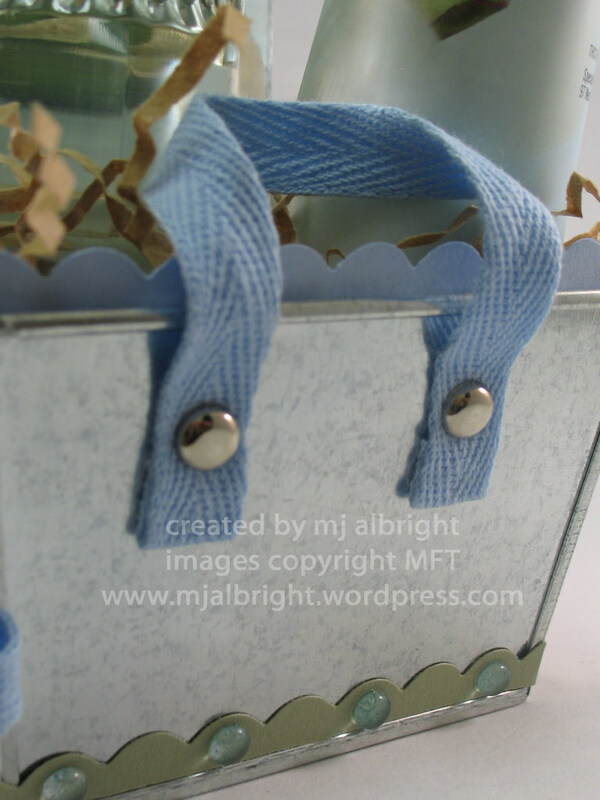 I used my 3/16″ corner rounder punch to create the scalloping to the bottom and inside top of tin. I then adhered some Dew Drops to every other scallop. The main image was watercolored. I added Ranger Crackle Accents to the tub. The light blue twill is from Creative Cafe. Every one needs a little encouragement at times. Especially a new Nurse. I am working with a lot of new GN’s and another round is due to graduate very soon. I couldn’t possibly find the time to make a card for each of them, so I will place this card in our break room at work for all of them. 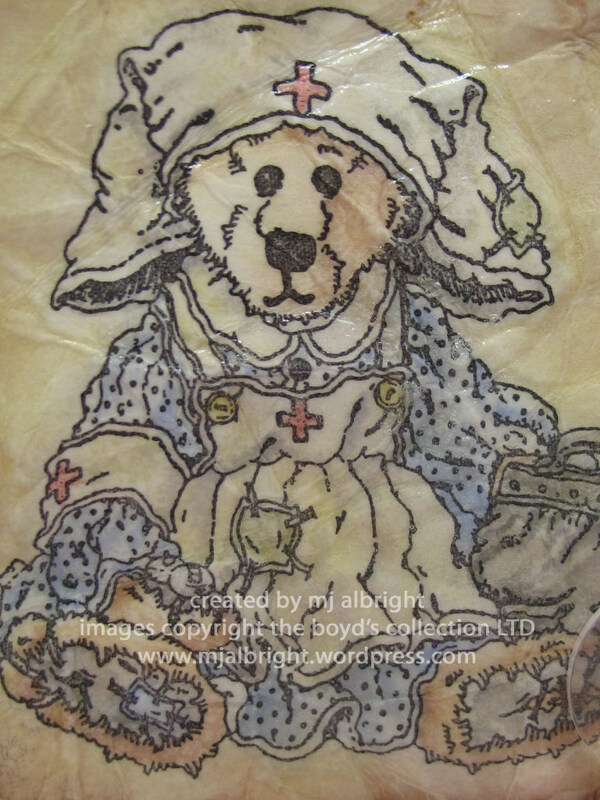 I just love Boyd’s bears. I’m not a collector, but I think they are adorable. I don’t live far from Gettysburg…which means visits to Boyd’s Bear Country. A fun place to visit with the kids. I’ll skip out on the history part any day and go right for the fun. I have had this stamp, Clara the Nurse for about 10 years. I actually purchased it when I graduated nursing school and made my own graduation invites for my Mother to send out. I did a search and couldn’t find any info on it (I don’t browse ebay, but maybe it’s there somewhere). The sentiment is from MFT Essential Sentiments set and the dots stamped in Versamark ink on the piece of Bordering Blue CS is from MFT Behind the Scenes set. I wanted the card to appear worn and ragged like the image. After the image was colored, I distressed, sponged, and wrinkled it up. I then applied Ranger Crackle Accents to it. The background base piece of CS was created with Ranger Distress Crackle Paint. I mixed together Old Paper and Vintage Photo to get the color I wanted. I added some twill tape and buttons to coordinate with the image. When I saw Taylor’s challenge for this weekend, I instantly thought bright and fun. How can you not when you visit her site. I have had my hands on some stamps that I’ve been waiting to use, and finally got the opportunity late tonight. I took a different approach with these adorable Changito monkeys….I colored them in bright colors to coordinate with my papers. I think of my kids when looking at this image. They are constantly doing “crazy” childish things to one another. Here is my find this past weekend. I had to go to my local office supply store. While browsing, I saw a Mead Watercolor paper tablet for under $5. I got 15 sheets of 9″ x 12″ white watercolor paper that works beautifully. 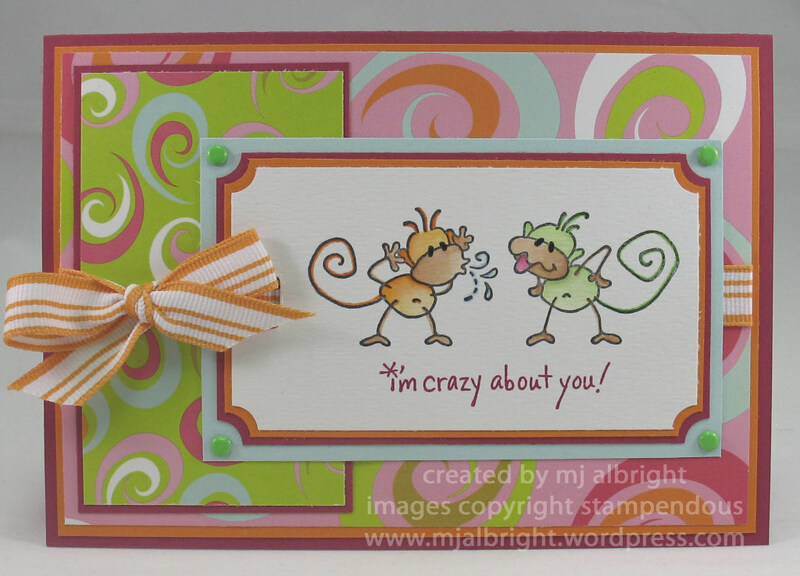 STAMP SETS USED: Stampendous Changito Amigos and Crazy about You sentiment. CARDSTOCK USED: Mead watercolor paper; SU! Pumpkin Pie, Purely Pomegranate, and Soft Sky CS; Tinkering ink “Grigette” patterned paper. INKS USED: Stazon Jet Black; SU! Pumpkin Pie, Purely Pomegranate, Creamy Caramel, Green Galore, Soft Sky stampin’ pads; Pumpkin Pie, Green Galore, Bashful Blue, and Creamy Caramel Stampin’ Write Markers. 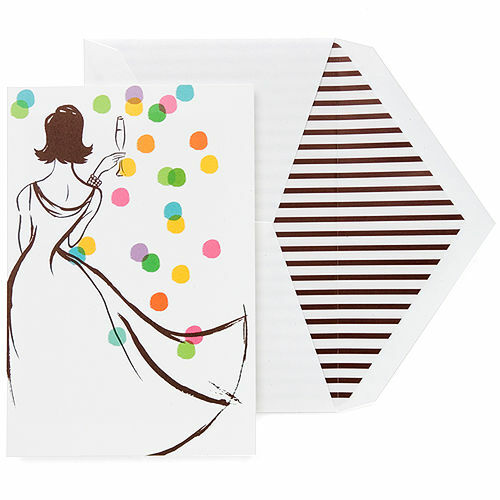 ACCESSORIES: Pumpkin Pie striped Grosgrain ribbon, ticket corner punch, horizontal slot punch, bold brights brads.